COMMON USE: Live fence row or screen. The Murray Cypress is a rapid growing tree that has fine, feathery, soft-green pointed needles on flattened branches. Matures to a majestic, dense, pyramidal shape. The Murray Cypress prefers well drained soil, and should be grown in full sun. The Murray Cypress is an "improved" Leyland Cypress. 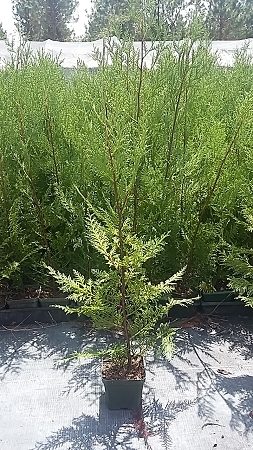 Our Quart Size Murray Cypress Average About 16 - 24 Inches Tall And Are Fully Rooted. My shipment of Quart Murray Cypress was delivered today. I ordered 24 Murray Cypress. The shipping was fast and the trees were carefully packaged with no damage. We are very happy with the way they look. The baby tress came out of the box nice and green with no signs of stress. Thank you !